We’d love your help. Let us know what’s wrong with this preview of Sons of the Sphinx by Cheryl Carpinello. Sons of the Sphinx is based on the schism that the Pharaoh Akhenaten shot through ancient Egypt when, according to historians, he turned his back on Thebes and the gods of Egypt. He built his own city to honor his god the Aten, and he insisted that the people of Egypt do the same. Along with this, he supposedly refused to send troops to defend Egypt's borders thus incurring the wrath of the then General Horemheb. When Tutankhamen becomes pharaoh, he reverses Akhenaten's proclamations and returns the governing center to Thebes and the worship back to the god Amun. To ask other readers questions about Sons of the Sphinx, please sign up. Armed with what she considers her grandmother’s curse, 15-year-old Rosa agrees to help the ghost of King Tut find his lost queen Hesena. Though Hesena’s ba inhabits part of Rosa, finding the whole spirit of Hesena so that she and Tut can be together for the first time in over 3000 years proves to be a harder task than Rosa first thinks. Thrust back into Ancient Egypt with Tut, Rosa discovers that finding Hesena is not all she must do. She must keep out of the reach of the living Horemheb – who crosses mortal boundaries using Seth’s evil magic – if she is to stay alive to make it back home. My Thoughts: Rosa is no ordinary 10th grader. She can hear and speak to ghosts – a gift she finds vexing at best. But her life is turned upside down when the ghost of King Tut appears at her side telling her that the spirit of his one true love, Ankhesenamun (Hesena), resides within her. Tut only has 7 days to travel back in time to find Ay, a trusted family friend, who can reveal the location of Ankhesenamun’s final resting place, thus bringing the two together for the rest of eternity. Standing in their way is General Horemheb, who with the help of the evil Egyptian God Seth, will stop at nothing to change the history books making his lineage the rulers of Egypt and portraying Tut’s family as traitors to Egypt. Travel back in time with Rosa in this well-written thriller plunging readers into the fascinating and often sordid history of ancient Egypt and its many rulers. Cheryl Carpinello managed to draw me into the story from the first chapter as we are introduced to Rosa, the main character who is telling the story from her perspective. I couldn’t help but feel sympathetic toward Rosa as a character who doesn’t quite fit in, but who also experiences what every teenage girl dreams about: the sudden appearance of a young attractive man who needs her help ~ *swoon*. Ok, maybe he is looking to be reunited with his one true love (not Rosa) and he (and his love) happen to be ghosts; but, still… it’s very romantic. Carpinello effectively deals with the tension among this “triangle” of characters: Rosa, Tut, and Hesena. Aside from these characters, there are a few Egyptian characters who play important roles in the overall plot including Ay, the Pharaoh who rose to the throne after King Tut died, and the evil General Horemheb who is able to step between the world of the living and dead to be a constant threat to Rosa’s life and to Tut’s mission. Tut spends a considerable amount of time unraveling the history of his family for Rosa’s (as well as the reader’s) benefit, correcting any misconceptions she may have had along the way. This was a clever way to introduce Egyptian history to young readers. The author includes a glossary of Egyptian Gods, Egyptian people with historical significance, and Egyptian places and terms. I found this to be helpful, but I felt that Tut’s family tree at the beginning of the book would have been helpful as many of the names were somewhat similar, shortened forms of names were sometimes used, and most of the names were difficult to pronounce. As we’ve seen with her other books (e.g., Guinevere: On the Eve of Legend, Young Knights of the Round Table: The King’s Ransom), one of the strengths of Cheryl Carpinello as an author is to indulge young readers with theories and hypotheses around some of the most popular legends of our time (e.g., Arthurian legend, the mysteries surrounding King Tut’s life and death). Carpinello has done her research and is so successful at immersing readers in these legends by creating vividly detailed historical fiction whereby the characters from these legends are featured in the stories themselves. For example, through Tut’s narrative, we learn that his father, Akhenaten was the first Pharaoh to move from polydeism (the worship of many gods) to monodeism (the worship of one god). We also learn details (i.e., theories) surrounding Tut’s death, Pharaoh Ay’s death, and the rise of General Horemheb to power all occurring within the 18th Dynasty. There is an incredible amount of educational value to Sons of the Sphinx. Sons of the Sphinx is a time-travel thriller featuring a race against time with the stakes being King Tut being separated from his beloved Queen Ankhesenamun for all of eternity as well as the history books forever portraying King Tut’s family as traitors to the people of Egypt. I recommend this exciting story to children ages 11 and older who enjoy reading stories about ancient Egypt or who are just looking for their next great adventure. Sons of the Sphinx by Cheryl Carpinello is a historical, time travel fantasy suitable for young adult and pre-teen readers. Rosa is not your ordinary tenth-grader; she hears the voices of dead people and can communicate with them. Her grandmother had the same gift, but Rosa is not so sure what a great gift it really is. Those voices interrupt her when she's trying to take tests, and she's gotten F's and ended up in trouble at school because of them. People have also started to wonder about her outbursts in the middle of class. One afternoon, when she's at home working on a history project about ancient Egypt, she's interrupted by a voice that mispronounces her name, which is then followed by a physical manifestation, who claims that he's Tutankhamen, and that only she can help him and his queen. Cheryl Carpinello's coming of age fantasy, Sons of the Sphinx, educates as it entertains. I loved reading about the various time frames that Rosa and Tutankhamen visit, and got a kick out of seeing the Sphinx in pristine shape through their eyes. Rosa is a plausible and funny main character who's been absolutely hopeless with guys and then finds herself with a gorgeous guy who just happens to be thousands of years old ... and is already taken. Sons of the Sphinx is filled with suspense and adventure as the two time travelers work against deadlines and the machinations of the evil Horeheb. Carpinello is masterful in her descriptions of ancient Egypt and makes this time travel fantasy very enjoyable indeed. Sons of the Sphinx is highly recommended. 15 year old Rosa has an interesting, if not unusual, problem . . . ghosts talk to her. It's troublesome, to say the least, to have dead people trying to carry on a conversation with her while she's taking a math test. But one day her unique connection to the underworld takes her headlong into an adventure through time. Rosa has a fascination with the Egyptian Dynasty, and in particular - King Tut. So when she is given an assignment to do a project on ancient history she naturally decides to base it on the life of the boy king. --That's when things really start to get weird for Rosa because for the first time ever an apparition appears before her, and the ethereal being is none other than the one-and-only King Tut. Soon after, Rosa is whisked away to ancient Egypt where she experiences first-hand encounters with tomb raiders, evil spirits and even friends and foe of King Tut. Sons of the Sphinx is an engaging work of fiction that incorporates many fascinating historical facts that are skillfully intertwined within the pages of a truly terrific read. Sons of the Sphinx comes highly recommended and has earned the Literary Classics Seal of Approval. I’m such a sucker for a story with characters who can either see, hear or sense dead people. That’s probably why I enjoyed Sons of the Sphinx. Rosa, the main character, can hear dead people. Once this was revealed, I was hooked. But the story became even cooler when King Tut shows up and asks her to help him find his lost love. So not only does this story have an awesome “dead person” gift, we also have some fascinating secondary characters and a beautiful love story! In addition to the great sto I’m such a sucker for a story with characters who can either see, hear or sense dead people. That’s probably why I enjoyed Sons of the Sphinx. Rosa, the main character, can hear dead people. Once this was revealed, I was hooked. But the story became even cooler when King Tut shows up and asks her to help him find his lost love. So not only does this story have an awesome “dead person” gift, we also have some fascinating secondary characters and a beautiful love story! In addition to the great story, I loved the world the author created. It was completely believable, and I wouldn’t be surprised to find out that the author had somehow found a way to travel back in time to the time of the Pharaoh’s. That’s how accurate this story felt. HoaP would like to thank Cheryl Carpinello for gifting us a copy of her book in exchange for an honest review. This review was first seen on Heart of a Philanthropist blog. I was very excited to read Sons of the Sphinx because I enjoy dystopian time travel adventures. I cringed when I opened the book and it started with the "I talk to dead people" story line. Upon further reading, I found out that this is not the typical approach to a paranomal book. I thoroughly enjoyed it and had a hard time put HoaP would like to thank Cheryl Carpinello for gifting us a copy of her book in exchange for an honest review. I was very excited to read Sons of the Sphinx because I enjoy dystopian time travel adventures. I cringed when I opened the book and it started with the "I talk to dead people" story line. Upon further reading, I found out that this is not the typical approach to a paranomal book. I thoroughly enjoyed it and had a hard time putting it down. Rosa is in class taking a math test and begins to yell at a ghost who is interrupting her thought process. The teacher sends her to the principal who sends her home. Everyone must think she is crazy! In her room, she tells the voice to go away, but it persists calling her Roosa. She turns around and to her surprise King Tutankhamen stands in her presence. He explains that he needs 'Roosa's' help in reuniting him with his Queen Ankhesenamun. Rosa is overcome by the Queen as she touches King Tut. The Queen speaks through Rosa. This is the first time Rosa has been possessed by another person. At first Rosa protests travelling back to Ancient Egypt (after all she has a paper due), but finally accompanies King Tut. In a swoosh of a second (and a stomach turning trip) they are in Egypt. The couple experience tomb raiders. (This is quite a funny scene). Rosa is almost killed more than once by Pharaoh Horemheb who does not want Rosa and King Tut to succeed in their mission. She meets a family member of King Tut. They are almost buried alive inside a pyramid. Rosa learns why no one discovered King Tuts burial chamber until 3000 years after he was mummified. Rosa is both terrified and fascinated by Ancient Egypt and the enemies she gains along the way. Will she ever be able to leave? Will she be able to reunite King Tut and his Queen? Does she even want to? There is a fascinating infatuation by Rosa to King Tut. This is an interesting addition to the story. Rosa must touch King Tut more than once to unite him with Queen Ankhesenamun. In the process, Rosa gets infatuated with the King. How could this possibly work? He is a ghost. She is alive 3000 years after his death. He is gorgeous, young, muscular, and intriguing. Every teenage girl would fall for a guy like him especially with the hormone party going on in their body. I like that the author addressed this. It made the story more believable. I found Sons of the Sphinx a great read! I homeschool my son. We are studying Ancient Egypt right now so the story came alive to me. If there were questions I had in the book, they were answered by our lessons. The story made the history lessons exciting. We used our imagination while we learned. (My son is always asking me to try and do fun stuff for school. This book helped accomplish this task.) Sons of the Sphinx is a work of fiction but it is obvious that the author did her research. She knew details, even explaining stuff that was not in our history book. There is a great glossary in the back of the book that we will use when writing our Ancient Egypt essay. 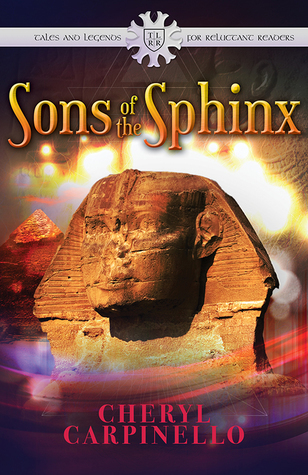 Prepare yourself for an incredible adventure in ancient Egypt when you pick up Sons of the Sphinx by Cheryl Carpinello. The story starts with a prophecy that sets the tone for magic, mystery, and mayhem in places. Rosa, 15, has an unusual gift she inherited from her grandmother: she hears the dead. Maybe it would be easier if she could see them and tell them to go away properly, and not have to put up with an annoying interruption in her maths test. Of course it is all Nana’s fault because once Prepare yourself for an incredible adventure in ancient Egypt when you pick up Sons of the Sphinx by Cheryl Carpinello. The story starts with a prophecy that sets the tone for magic, mystery, and mayhem in places. Rosa, 15, has an unusual gift she inherited from her grandmother: she hears the dead. Maybe it would be easier if she could see them and tell them to go away properly, and not have to put up with an annoying interruption in her maths test. Of course it is all Nana’s fault because once Nana told Rosa and a friend about the spirits that visited her, life was never quite the same. At age 15, when all you want to do is fit in and be accepted, that’s not the kind of thing guaranteed to win friends and influence people. The really scary part comes when, from only being a voice, the young pharaoh Tutankhamun appears large as life in Rosa’s bedroom, telling her he needs her to help in a vital mission. How much better can it get? Tut tells Rosa that part of his one true love, Ankhesenamun, is now contained within Rosa, and he needs to take Rosa along with him to find her burial place so they can be united. The problem is this mission must be fulfilled within seven days and Rosa’s parents, who’ve gone to a movie, will be back by midnight. But that’s not a problem as Tut explains what a time wrap is to the bemused Rosa. However, hurtling back to the ancient past isn’t going to be an easy ride. Danger, magic, evil and the possibility that Rosa might not be able to return home dog their footsteps. What a story as Cheryl Carpinello displays her expertise as both a writer and an educator in her incredibly detailed portrayal of life in ancient Egypt. Readers will feel the sun’s heat, smell the perfumes and spices, taste the food, touch the artefacts, and bask in the glory of Egypt’s past. Threaded through the non stop action and adventure, the author drops in the right kind of historical information in bite sized pieces, painting a portrait of the ancient past, the story behind the rulers and their people, their relationships, and their choices, both good and bad. I really enjoyed the portrayal of Rosa as a typical teenager with the issues, problems, angst, crushes, and awkwardness of her age. The dialogue is spot on with the nuances and colloquialisms that will appeal to the intended target market. I also enjoyed Rosa’s often sarcastic inner monologue as she deals with sand, heat, sunburn and a lot of discomfort, not having had 3000 years to rack up the right kind of experience with these matters. For me, the most compelling part of this intriguing adventure is the subtle lessons Rosa learns that are contained in the story: the value of life, the value of love, trusting your instincts, trusting in friendship, finding the courage within, and finding self belief. I think teens will just love every aspect of this well written, mesmerising tale. I received a copy of this book from Double Decker books as part of a blog launch for the author in exchange for an honest review. First off, I will openly admit that I am a historian with an avid interest in the field of ancient history. The author has done a marvelous job of negotiating the disputed points of this era and woven them into a seamless time travel historical adventure for middle grade, teen readers and adults. Her characters are well-developed and manage to appear authentic in both I received a copy of this book from Double Decker books as part of a blog launch for the author in exchange for an honest review. First off, I will openly admit that I am a historian with an avid interest in the field of ancient history. The author has done a marvelous job of negotiating the disputed points of this era and woven them into a seamless time travel historical adventure for middle grade, teen readers and adults. Her characters are well-developed and manage to appear authentic in both the ancient and modern time periods. Carpinello includes a glossary to assist the reader in understanding the historical figures and background. Rosa is a fifteen year old tenth grader who has inherited a special gift from her grandmother. This teen is able to speak to people of the past, who appear to her at most inconvenient times like during a math test. At the outset of this adventure, King Tut himself not only speaks but appears to her in her room. He urges her to travel back in time with him to find the spirit of his love, Hesena. Rosa has never dated, but finds herself falling for Tut. She agrees to help him, if they can get back before her parents return from dinner and the movies. Tut assures her that the time wrap will allow them to do so. Rosa will need to draw upon her inner spirit to connect with Hesena, fight off tomb robbers, traverse the hot sands of the Egyptian desert, and fend off the evil Pharaoh Horemheb in their attempt to complete their quest and right the wrongs that have been done. She will travel back more than 3000 years in time, but never have the opportunity to share her experience with her family and peers. Yet Rosa's talent and spirit shine through and allow her to fight her fears and grow stronger. I received this book in an exchange for an honest review. The Sons of the Sphinx is about Rosa a 15 year old girl who is able to hear spirits and because of it she’s able to meet King Tutankhamen who asks that she help him reunite with his Queen and bring honor to his family and being the romantic that she is agrees. Not really knowing what she’s gotten herself into but she soon finds out that it isn’t that simple. Throughout Rosa’s journey in ancient Egypt she has threats on her life by Horemheb I received this book in an exchange for an honest review. Throughout Rosa’s journey in ancient Egypt she has threats on her life by Horemheb and while at times it does become too much she still doesn’t give up in helping Tut. I loved Rosa as a character, she seemed like a real frightened 15 year old girl worrying about more than a teenager should at their age but she managed to brave it through her. During her journey with Tut she grows as a character, she realizes that the ability her grandmother passed down to her is not a curse but a gift. If it had not been for her ability to see spirits she wouldn’t have met Tut or traveled through ancient Egypt. King Tutankhamen’s character I had a great sympathy towards and I felt saddened by the way his life had gone during his time. I was happy that Rosa helped him along the way and comforted him when he needed it. In a way they both helped each other grow as characters. Sons of the Sphinx is a wonderful book and I enjoyed reading every minute of it. I loved that the books setting was in Egypt because I actually haven’t had the chance to read a book with the setting being in such a wonderful place like Egypt. I loved Carpinello’s depiction of Egypt though I personally have never been there she made it possible for me to imagine it. If you are looking for a great preteen, action/adventure, Time travel book with a hint of romance. Then look no more this story is just for you. The Great Sphinx of Giza is one of the most recognizable monuments in the world. I was immediately captivated by the cover because of it. I absolutely adore Egyptian history and culture so I was excited to read this one. I was not sure what to expect from this story, so I was pleasantly surprised when reading it. The main character Rosa could speak to ghosts. While trying to take a math test, Rosa began to hear a male's voice. Soon the ghost of King Tut appeared to Rosa seeking help. She was then transported 3,000 years to the past where she met peril. It was absolutely fun to read this book. It was engaging for it had its drama and action. I found myself flying through the pages. I greatly appreciated the history and myths that were told throughout the story. It was obvious that the author did her research. The history and myths were wonderfully put together in a smooth manner. I was able to picture King Tut's memories and envision what ancient Egypt looked like. It was great to see how the author's research and details flowed together with the plot. This book did read fast. I was able to read it in a couple of hours. Many of the transitions slightly bothered me for I felt that everything was happening too quick. I would have liked to have read more elaborations, such as Rosa's character being able to speak to dead people. However, the story was still fascinating that I was able to be hooked from beginning to end. Rosa has a fascination with the Egyptian Dynasty, and in particular - King Tut. So when she is given an assignment to do a project on ancient history she naturally decides to base 15 year old Rosa has an interesting, if not unusual, problem . . . ghosts talk to her. It's troublesome, to say the least, to have dead people trying to carry on a conversation with her while she's taking a math test. But one day her unique connection to the underworld takes her headlong into an adventure through time. Cheryl Carpinello is a very gifted writer. Sons of the Sphinx is a fast read that is geared toward younger readers but, I have to say I thoroughly enjoyed every page. This is a fast read. A PERFECT read for the weekend, cuddled up on the couch. The story centers around 15 year old Rosa. Rosa is no ordinary teen. She can hear dead people. Rosa tries to reunite King Tutankhamen with his Queen and bring honor to his family isn't the easy task she believed it would be. Follow Rosa’s journey in ancient Cheryl Carpinello is a very gifted writer. Sons of the Sphinx is a fast read that is geared toward younger readers but, I have to say I thoroughly enjoyed every page. This is a fast read. A PERFECT read for the weekend, cuddled up on the couch. The story centers around 15 year old Rosa. Rosa is no ordinary teen. She can hear dead people. Follow Rosa’s journey in ancient Egypt, dodging Pharaoh Horemheb (Bad guy!!) and bringing honor to King Tutankamen family. Rosa's character is my favorite. I love this young woman's spit and fire! Rosa and Tut are very sleuthlike, in that they must discover and interpret clues as to the final resting place of Ay, who will tell them where Ankhesenamun is buried. It's an interesting pair, one teenager from the past and one from the future, using what knowledge they have of the time to move from one clue to another. The historical detail was fascinating and well woven throughout the narrative. The various landmarks and the terrain in general leapt from the pages, placing the reader in an anci Rosa and Tut are very sleuthlike, in that they must discover and interpret clues as to the final resting place of Ay, who will tell them where Ankhesenamun is buried. It's an interesting pair, one teenager from the past and one from the future, using what knowledge they have of the time to move from one clue to another. The historical detail was fascinating and well woven throughout the narrative. The various landmarks and the terrain in general leapt from the pages, placing the reader in an ancient, and somewhat exotic time. It has an engaging and well developed plot, dynamic characters and was a fun read. I'm sure young adults will enjoy the attention to detail and the journey back in time. Whether you are young or old, have an interested in ancient Egyptian culture or not, you will be amazed by this book! This book has a little bit of everything, time travel, mystery, some paranormal, romance (very G rated) and history. I felt like I learned a lot about King Tut and what life might have been like back then. I like that it is seen though a teen's eye as it is a different perspective than what an adult might think or do. Recommended for fans of ancient Egypt who like a little magic mixed in. I have read and reviewed the prequel to this one, Tutankhamen Speaks, and was pleased to nab a copy from the author to continue the story. This is an original time travel adventure that gives a fresh new perspective from the view of Tut himself. The main character, Rosa, is a modern-day girl who has a gift that allows her to speak with the dead (a gift that she's not really too thrilled about). Tut contacts her and convinces Recommended for fans of ancient Egypt who like a little magic mixed in. I have read and reviewed the prequel to this one, Tutankhamen Speaks, and was pleased to nab a copy from the author to continue the story. This is an original time travel adventure that gives a fresh new perspective from the view of Tut himself. The main character, Rosa, is a modern-day girl who has a gift that allows her to speak with the dead (a gift that she's not really too thrilled about). Tut contacts her and convinces her that she has a role to play in reuniting his spirit with that of his great love, Hesena. After a little convincing and debating within her own mind, Rosa agrees to help him. As they embark through time to find the clues she finds that Tut is at times rather cool towards her, and he never gives her much information. Just enough, but never too much. As she finds herself falling for him, she fights the feelings as she knows that there is no future for them to be together. The thing is, that she has part of Tut's great love's spirit within her, so it's a battle in her mind to know which feelings are her and which are not. Tut is very guarded and he continually switches between his ruler persona and a more personal one. This becomes quite frustrating for Rosa. The book effectively compares old to new life, revealing that the underlying needs of the characters are the same, whether ancient or modern. They all want to be with the ones they care for. Tut with Hesena, and Rosa to return home to her family. Rosa has always been a fan of ancient Egypt and had long built up the romance of Tut's story within her own mind. It was a dream come true for her to actually become part of his story, and to help him reunite with his wife in the afterlife, but in reality it is home she craves for. It's obvious that Cheryl Carpinello has great interest in ancient Egypt and a great deal of research is evident. The book contained a lot of information and I probably only picked up half of the details, but enough to follow the story. I enjoyed the plot and the original time-travel angle. The book also gave me a different perspective of a curse, by showing it from the view of the curser (Tut's spirit in his tomb) and it's impact on the grave robber victims. Karma comes to mind. It also provoked thoughts as to whether archaeologists are any different to ancient grave robbers. They both disturb sacred sites to fulfil their own goals. The main difference (I hope) is the archaeologist's ultimate goal is preservation rather than instant wealth. In a nutshell: This was an entertaining time-travel adventure with a twist. It succeeds with a nice blend of fact and fiction. Recommended for fans of ancient Egypt who like a little magic mixed in. A good story for teens and adults who are young at heart. Travel to ancient Egypt through the eyes of a tenth grader named Rosa as she uses her special gifts in an attempt to bring honor to King Tutankhamen’s family. Rosa is an ordinary teen who struggles to fit in with her peers, however she must also come to term with the gift that her grandmother bestowed on her. As it turns out, Rosa’s gift allows her to not only to hear and speak to dead people, but actually travel back to ancient Egypt. Without warning King Tut appears to Rosa in her bedroom askin Travel to ancient Egypt through the eyes of a tenth grader named Rosa as she uses her special gifts in an attempt to bring honor to King Tutankhamen’s family. Rosa is an ordinary teen who struggles to fit in with her peers, however she must also come to term with the gift that her grandmother bestowed on her. As it turns out, Rosa’s gift allows her to not only to hear and speak to dead people, but actually travel back to ancient Egypt. Without warning King Tut appears to Rosa in her bedroom asking for help finding the spirit of his long, lost, love Hesena. Rosa has to fight unimaginable fears in order to travel back 3,000 years, deal with a hostile environment, and an evil Pharaoh, not to mention tomb robbers in order to connect with the spirit of Hesena all with the hopes of righting the wrongs of this ancient past. He looks at me and frowns. I see something in his eyes, briefly, that mirrors the disappointment in my dad’s eyes the day the cops brought me home. I ditched school after one of those talking ghost episodes. They picked me up at the shopping mall an hour before school was out. An hour! I have all the luck. I cough as my throat tickles in an irritating way. ‘Sons Of The Sphinx’ is a fast paced, historically accurate time travel adventure that will enlighten and engage the hearts and minds of readers from pre-teen to adult. Author Cheryl Carpinello has not only researched ancient Egypt, but travelled there herself. This book details the Eighteenth Dynasty (1550-1295 BC) and includes a map of Ancient Egypt. There is a glossary of Egyptian Gods, People, Places and Terms which is most beneficial. Since early high school in AP History classes, I've been enthralled with Ancient Egypt, and I've watched every documentary on the pyramids, pharaohs, cultures, and everything pertaining to that time period, so I already greatly anticipated taking the time to read Sons of the Sphinx. I also love a variety of paranormal reads, and this one satisfied me completely. From the beginning of the novel the author had me hooked, and I read the book in one sitting when I should have been sleeping, but ther Since early high school in AP History classes, I've been enthralled with Ancient Egypt, and I've watched every documentary on the pyramids, pharaohs, cultures, and everything pertaining to that time period, so I already greatly anticipated taking the time to read Sons of the Sphinx. I also love a variety of paranormal reads, and this one satisfied me completely. From the beginning of the novel the author had me hooked, and I read the book in one sitting when I should have been sleeping, but there are no regrets. Although Sons of the Sphinx is geared towards a younger crowd, it proved a refreshing change and thoroughly enjoyable read from the adult novels I've read and reviewed in the last few months. Rosa's courage, bravery, brilliance, and compassion entwined with normal conflicted teenage thoughts and soul-searching made her an endearing female protagonist, and I couldn't help but pity the poor soul of her ghostly companion as they embarked on the perilous journey of fulfilling an ancient prophecy. Pharaoh Horemheb is the consummate villain, and between his vile antics, Rosa's mixed romantic feelings and noble actions, King Tut's longing for his lost queen, and the dangers of what is easily called an epic journey in the truest sense, made Sons of the Sphinx a quick page-turner. Cheryl Carpinello is a gifted writer, and Sons of the Sphinx is a beautifully executed novel with three-dimensional characters, excellent plot twists, and a brilliant climax and conclusion. I didn't experience one dull moment while reading the book, and I felt disappointed when I reached the end--another indicator of a great novel. Lovers of historical fiction, a fascination with the paranormal, and the pangs and lessons involved with coming-of-age novels will love Sons of the Sphinx. It is more than worthy of the accolades received thus far, and I highly recommend purchasing Sons of the Sphinx today. I REALLY ENJOYED READING SONS OF THE SPHINX. I LOVE PARANORMAL BOOKS ESPECIALLY YOUNG ADULT. THE AUTHOR DID A WONDERFUL JOB INCORPORATING THE HISTORY INTO THE STORYLINE. CHERYL HAD ME DRAWN INTO THE STORY FROM THE VERY FIRST PAGE UNTIL THE VERY LAST PAGE. THE BOOK IS FILLED WITH ACTION, HISTORY, AND ROMANCE. I LOVE HER WRITING AND ENJOYED ALL THE CHARACTERS IN THE STORY. ROSA HAS A SPECIAL GIFT. SHE CAN HEAR AND COMMUNICATE WITH DEAD PEOPLE WHICH NORMALLY GETS HER IN TROUBLE. SHE THEN MEETS TUT W I REALLY ENJOYED READING SONS OF THE SPHINX. I LOVE PARANORMAL BOOKS ESPECIALLY YOUNG ADULT. THE AUTHOR DID A WONDERFUL JOB INCORPORATING THE HISTORY INTO THE STORYLINE. CHERYL HAD ME DRAWN INTO THE STORY FROM THE VERY FIRST PAGE UNTIL THE VERY LAST PAGE. THE BOOK IS FILLED WITH ACTION, HISTORY, AND ROMANCE. I LOVE HER WRITING AND ENJOYED ALL THE CHARACTERS IN THE STORY. ROSA HAS A SPECIAL GIFT. SHE CAN HEAR AND COMMUNICATE WITH DEAD PEOPLE WHICH NORMALLY GETS HER IN TROUBLE. SHE THEN MEETS TUT WHO ASKS FOR HER HELP IN CORRECTING HISTORY. TUT TAKES ROSA ON AN UNFORGETTABLE JOURNEY WHERE WE LEARN SO MUCH ABOUT KING TUT. TUT AND ROSA FACE MANY OSTACLES AND DANGERS. AS THEIR JOURNEY CONTINUES, THEIR BOND DEVELOPS AND ROSA FINDS HERSELF FALLING IN LOVE WITH TUT. WILL ROSA AND TUT BE ABLE TO CORRECT HISTORY AND REUNIT TUT WITH HIS WIFE? There is no better way to fall in love with history than to time-travel back into history via a story - especially if you are time traveling with young King Tut hismelf. I read an early version of this story and loved it, and am thrilled to see the published version available now! a cute read for pre-teens. like the story line. A definitely different take on Egyptian lore and when a long dead pharaoh makes an appearance in a young high school girl's room, she's really not ready for what comes next. It was a quick read with some humor and sarcasm in a good way(of course).You liked Rosa and even the pharaoh that made an unexpected appearance in her room and how she even managed to cope with everything that came after that particular visit. So when you get a chance, pick up a copy and enjoy. Great book for those middle readers. If they like to read about the Egyptian gods, want an adventure back in time this might be a book for them. I’m a retired high school English teacher. Currently I'm on the Board of Directors of the Colorado Authors' League, the oldest writing organization in Colorado. I also belong to the RMC-SCWBI, the Historical Novel Society, the Rocky Mountain Fiction Writers, and the Egyptian Study Society. A devourer of books growing up, my profession introduced me to writings and authors from times long past. Thro I’m a retired high school English teacher. Currently I'm on the Board of Directors of the Colorado Authors' League, the oldest writing organization in Colorado. I also belong to the RMC-SCWBI, the Historical Novel Society, the Rocky Mountain Fiction Writers, and the Egyptian Study Society. A devourer of books growing up, my profession introduced me to writings and authors from times long past. Through my studies and teaching, I fell in love with the Ancient and Medieval Worlds. Now, I hope to inspire young readers and those Young-at-Heart to read more through my Tales and Legends for Reluctant Readers set in these worlds—Ancient Egypt, Medieval Wales, and coming soon, the ancient world of Atlantis. My husband and I love to travel. Because I'm also a retired airline employee, we were fortunate, in 2008, to spend three weeks in Egypt traveling by local train from one end of the country to the other. In 2014, we spent three weeks in the UK driving over 1700 miles through England, Wales, and Scotland.